While you likely know that you should brush your teeth at least two times a day, you may not think too much about the toothpaste you are using. When you walk through the toothpaste aisle at your local grocery store, you may head straight for the toothpaste that you have always used, ignoring the rest of the wall of other toothpastes. But if you step back and actually look at how many different toothpastes there are and what they all claim to do, it can get overwhelming. If you feel lost while trying to choose a toothpaste or you are simply wondering if you have been using the right one for you, you have come to the right place! At Brookside Dental Care, we can help you with any of your dental needs and offer a variety of dental services. For now, we wanted to help you with this toothpaste dilemma! How are you supposed to choose the right toothpaste for you and what should you look for? In this blog, we will tell you. Most of the toothpaste sold in the US contains fluoride, which is a chemical that most dentists say is important to have in your toothpaste. Fluoride can help protect your teeth from developing cavities and plays an important role in dental hygiene. Fluoride toothpaste is especially useful for those who are prone to cavities or dry mouth. If you want to whiten your teeth, buying a toothpaste with whitening in it is a great option. This will help brighten your smile over time and leave your teeth whiter than they were. However, if you have sensitive teeth, you will want to avoid whitening toothpaste. The chemical agents used to whiten your teeth can cause irritation and worsen your tooth sensitivity. Toothpaste with baking soda is a gentle and effective way to clean sensitive or cavity prone teeth. When you use baking soda toothpaste, you will notice the same clean feeling that regular toothpaste can give you without the sensitivity that you may experience when using those other toothpastes. Baking soda has acid neutralizing properties that make it an effective cleaner. When you are shopping for toothpastes, you will want to find one with the ADA seal. If a toothpaste is ADA approved, it means that it meets the requirements of the American Dental Association. 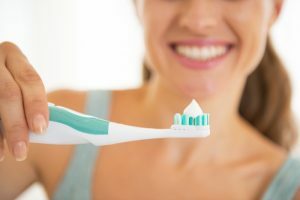 While this is a voluntary program toothpaste brands can participate in, when you find a toothpaste that is ADA approved, you will know it is a good choice. However, that should not be what you base your choice off of, many other great toothpaste brands choose not to participate in the program, but they may still meet the requirements. 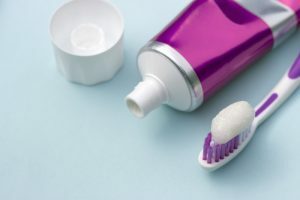 As your peruse the toothpaste aisle to find the perfect toothpaste for you, you may notice that there are many different toothpastes that are specific for many different needs. Toothpaste for gum health, tartar control, smokers, sensitive teeth the list goes on and on. If you have a specific need that you want to target with your toothpaste, searching for one of these products may be a great option. We suggest talking with your dentist about what toothpaste is best for your needs and which they recommend. Depending on what you need, there may be some toothpastes or ingredients to avoid and some you should look for in your toothpaste. When you choose a natural toothpaste, you will just want to be aware of what you are getting. Most natural toothpastes don’t include fluoride which may reduce their cavity-fighting abilities. While toothpaste without fluoride may be better for younger children, it is recommended that adults use toothpaste with this ingredient. But if you do choose natural, just make sure to read the ingredients carefully to make sure you know what you are getting. These are a few of the tips to follow when trying to find the right toothpaste for you! If you need help finding toothpaste or you need other dental services, be sure to schedule an appointment at Brookside Dental Care in Cheyenne today. Our team can help your with any of your dental needs.